PSALMS 91:1 KJV "He that dwelleth in the secret place of the most High shall abide under the shadow of the Almighty." 1He that dwelleth in the secret place of the most High shall abide under the shadow of the Almighty. 2I will say of the LORD, He is my refuge and my fortress: my God; in him will I trust. 3Surely he shall deliver thee from the snare of the fowler, and from the noisome pestilence. 4He shall cover thee with his feathers, and under his wings shalt thou trust: his truth shall be thy shield and buckler. He that dwelleth in the secret place of the most high: shall abide vnder the shadow of the Almightie. 91:1 He - He that makes God his habitation and refuge. 'He' in this verse means an elect of God, holy and beloved. Compassion, kindness, humility, gentleness, patience, etc are the secret place of God which His elect should put on in order to abide under His shadow. He that faithful to Him, ready to do His will, rooted and grounded in Him, love Him with his her heart,etc shall abide under His shadow. To my own understanding, the word 'he' in this particular verse is not a general statement. That he means those that are committed to him and ready to serve and obey Him at any point in time. The secret place of the Most High in this context means His holy place, righteous place, faithful place, upright place, etc. 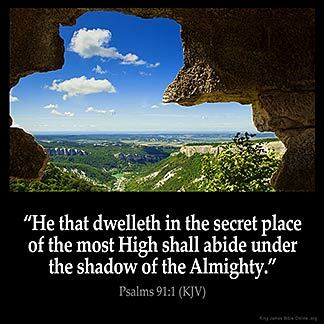 And as many that are ready to dwell in that secret place shall abide under His shadow. What's actually d secret place of God?where can we find it and how can we dwel in it without destroying it with our own doing? "HE THAT DWELLETH IN THE SECRET PLACE OF MOST HIGH SHALL ABIDE UNDER THE SHADOW OF THE ALMIGHTY", The secret place is the separate place where we keep our valuable properties, our essentials goods and treasures The owner of these property presence will always be there in that secret place physically or in mind, to provide serious security and protection for his essentials HE THAT DWELLS IN THE SECRET PLACE WHERE GOD PRESENCE ARE WILL NOT BE AFRAID FOR THE TERROR BY NIGHT,ARROW BY DAY PESTILENCE THAT WALK IN DARKNESS NOR DESTRUCTION THAT WALKS AT NOONDAY,BUT YOU MUST ENTER HIS SECRET PLACE,THROUGH THE STRAIT GATE YOU MUST BE BORN AGAIN. i have assurance that almighty god will keep me in highly secret place where god lives .